Have you ever imagined how it would feel if the floor beneath your feet slipped? Literally? This incredibly scary, yet thrilling experience can now be enjoyed at the El Vuelo Del Condor in Banos. While Casa del Arbol (Swing at the end of the world) is quite famous, its sister swing is hidden amongst the green blanket that wraps the mountains. 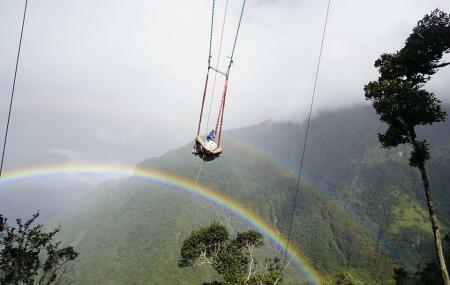 Claimed to be one of the best mountain swings, the view of the vast valley is terrifying, but exciting at the same time. Standing with a full body harness on a tiny plank, the countdown begins. And once the plank slips off, you dive into the canyon, swinging to and fro. This adrenaline rush is worth every penny. Go ahead and treat yourself with this rush. Banos is replete with experiences which can be enjoyed with any of the Banos tours! Want to plan a DIY trip? Use Banos trip planner for the same. Book perfect hotels in Banos like La Casa Verde Eco Guest House, Napolitano Apart Hotel, Casa Giralda and La Villa Del PeÃÃÃÃ‚‚ƒÂ±on Hotel & Spa.. There are plenty of ready-to-book Banos vacation packages available that will cover the major attractions, accommodation concerns including the prime one like how to reach Banos. Love this? Explore the entire list of places to visit in Banos before you plan your trip. Fancy a good night's sleep after a tiring day? Check out where to stay in Banos and book an accommodation of your choice. How popular is El Vuelo Del Condor? People normally also visit 12 De Noviembre Park while planning their trip to El Vuelo Del Condor. People also prefer to start their day with El Vuelo Del Condor. We thought the swing was really fun and the staff was very professional and friendly. I knocked off a star because we thought it was a little expensive. The big swing was $20 and the small one was $10. For a family, that can really add up. The view is beautiful and it looks like they may be building more things up there. I was very lucky to get clear skies. It was fantastic but do wait till the skies are clear. The view is great. The only thing bad is that the gear they give you is dirty. They do not clean it and it has the sweat of everyone else on it. Take a handkerchief with you and put it over your head before you put their helmet. I think the place has potential. It is located in an amazing spot, with a great view but I don't think it offers a real or unforgettable experience. It's just a very big swing but nothing that you would miss if you don't do it. Amazing experience for my husband and a thrill and joy for all of us to watch!! If you want adventure and high adrenaline, this is for you! And doing forget about the breathtaking views and forever memories and great shots!